Anyone who even casually reads this blog should know that I love Provo. That’s why I’m writing. That said, however, I’m well aware that everything in Provo is not perfect. And unfortunately, one of the issues we struggle with is gender equality. According to the Deseret News, Provo women make some of the lowest salaries in the entire country*. That’s pretty disheartening. It’s bad simply because, I’d argue, it’s inherently bad to have systematic gender inequality*. But it’s also bad because it hamstrings our city’s development. Women make up a considerable part of the work force, especially the creative class, and if Provo can’t offer competitive salaries the city will lose valuable and innovative workers. This phenomenon also may be part of the larger problem of generally low salaries. How can any part of a city gentrify — a goal I often hear repeated — if no one makes a gentrifying salary? How can we expand retail opportunities (in downtown, for example) if we don’t have the money to support them? There are certainly a variety of factors contributing to Provo women’s low salaries, as well as ways to work toward a solution. But for now we hopefully can begin seeing this as one of the many challenges Provo needs to overcome on it’s path to economic development and sustainable growth. Trees Trees Trees: The Provo Tree Guide, Etc. One of the coolest things about Provo is the Tree Guide. I’ve spent a fair amount of time perusing this document and trying to figure out what trees grow around my home and in the parts of the city I frequent. I was going to blog about this wonderful document in the spring, when the trees were getting their leaves back, but the mayor wrote about it Monday so I figured that was as good a reason as any to bring it up here. The mayor’s post is especially good because it points out that A) Provo is consistently recognized for its trees, and B) we have a city forester. It’s also worth noting the important role that trees play in a city. Those two links both go to articles discussing how trees have positive environmental, health, and economic impacts in cities. In short, cities with lots of trees are better. As I’ve written before, urban trees also have the potential to feed people. Walkability is major. The economic, environmental, health and other benefits of walkable communities are well-documented and too extensive for me to list here. But it’s important to remember that in addition to the hard facts regarding and quantifiable benefits of walkable communities, they’re also simply more pleasurable to experience. In all the places I’ve been in the world, the walkable ones are invariably the ones I enjoyed and wanted revisit. They’re the ones I’d consider moving to. In other words, there is an abstract, perhaps almost spiritual, benefit to having a walkable community. I can’t, after all, easily measure the joy I feel while walking through a charming street or neighborhood, but I certainly understand what it’s like. To see that walkable streets are, among many other things, simply pleasurable streets I recommend reading this article from The Atlantic Cities Kaid Benfield. Though the article has some text, it’s really just a picture gallery showing that walkability is also very much about beauty and its importance in a community. Slate’s Matthew Yglesias recently wrote a fantastic piece about how different kinds of public transit create different types of communities. He points out that in communities like Boston or Brooklyn, mass transit has created dense, high-value, walkable communities. In the D.C. area, however, one transit line treats train travel more like car travel by emphasizing the speed of the trains and by spreading out stations. In other words, it focuses on how quickly it gets people from point A to point B.
Yglesias’ point is that a federal law may soon allow a different approach to transit, but the distinction he makes is an incredibly important one: some public transit focuses on intra-community travel and walkability, while other transit looks at how to move people quickly over long distances. Both kinds of transit are important, of course, but Yglesias aptly argues that in order to create valuable, walkable communities transit stations need to be located close to one another and surrounded by dense structures. In other words, intra-community travel is what really has the biggest impact on a community. Unfortunately, Provo’s coming commuter rail is more like the D.C. example Yglesias uses. The stations will be spaced far apart with the emphasis on getting people from one distant community to another. That’s obviously better than car transit, but it won’t necessarily make a major dent in the car-to-resident ratio. Yglesias’ argument also suggests that transit like Provo’s won’t necessarily have a significant revitalizing effect on the surrounding area downtown Provo because it isn’t designed to facilitate intra-communty walking or density. One of the big national (urban) stories this week is that historic and old buildings are the greenest buildings. The story was picked up by a bunch of different news outlets and urbanist publications, among them The Atlantic Cities, Grist and Good Environment. You can find the source of these many articles here. This should be very good news for Provo, which has struggled mightily with historic preservation. Some old buildings certainly cease to be functional — the old Atchafalaya building, for example, couldn’t have become a convention center. 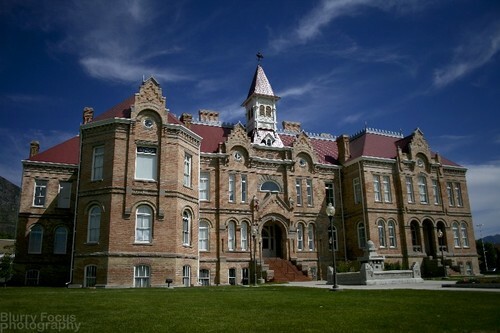 But many of Provo’s older homes and other buildings can continue to occupy a valuable place in the community. And thanks to this new research, we now know that preserving these structures isn’t just motivated by nostalgia. Rather, preservation now clearly has an environmental justification. We talked briefly about the new Frontrunner train, as well as the coming Bus Rapid Transit system (BRT), but as we talked I started to wonder how successful our new systems will actually be. My previous posts have focused on how the city can create a more conducive and walkable environment around the public transit hubs, which logically would lead to greater use. But Utahns don’t currently have a strong tradition of using public transit. Though our state isn’t as bad as some (California, Arizona), we’re still a driving culture. Inadequate population density aside, it remains to be seen if people in Provo will actually use commuter rail and BRT when arrives. All of which raises the question: how do we persuade people to talk public transit? That’s no easy question to answer and I plan to research answers — and blog about them — over time. But I think one big thing we (i.e. advocates of public transit, residents, city and state government personnel, etc.) can do is reveal the benefits of public transit. I suspect that there are many people who might consider it inconvenient, slow, expensive, or any number of undesirable things. In other words, our driving culture may have also created a culture of ignorance and misinformation with regard to public transit. To that end, here are a series of positive and surprising facts regarding public transportation. And here are a few more, related to quality of life, from the same website. As expected, this information indicates that public transportation generates jobs, community wealth, environmental progress, and citizen health, among other things. This is the sort of information that people in Provo, and in Utah generally, need to be exposed to. Can Downtown Get By Without More Parking? As anyone who has ever driven into downtown Provo will know, it’s not hard to find parking. Sure, you might not be able to park directly in front of Velour, the Covey Center, or Communal, but over all there is an over abundance of parking. That said, I anticipate that parking could be a major objection to bringing in large retailers, especially a chain store or two. But the idea of necessary massive parking lots and seas of concrete — or even for abundant curbside parking — is increasingly being debunked. This post discusses what basically amounts to an experiment in San Francisco, during which street parking was temporarily eliminated. Counterintuitively — but not surprisingly for those who watch these sorts of things — the experiment was a success with business owners actually saying they benefited. Provo is very different from San Francisco, but the point is that sometimes parking concerns are blown out of proportion. Like all cities along the Wasatch Front, Provo is a long way from getting ride of all downtown parking, but for now at least it seems that we have plenty.